I don't think there is a bug here. 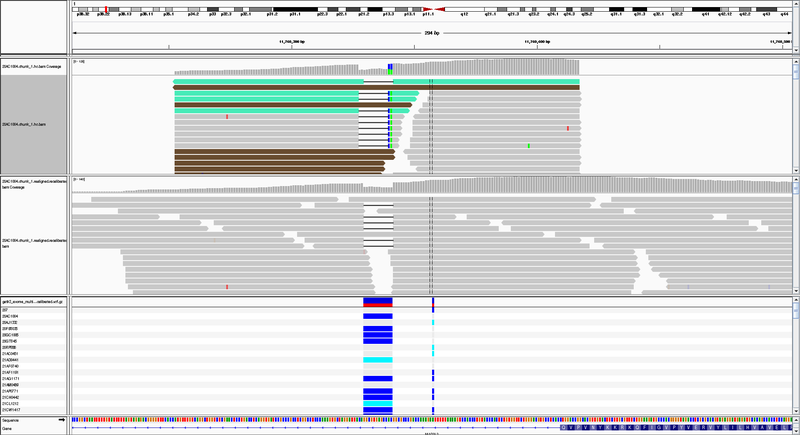 The top haplotype is correct, then there's a short stack of reads where the realignment is questionable (the two bases right after the event could also be put right before it). Presumably, there are more reads further down (that I cannot see) that are realigned optimally, so ultimately Haplotype Caller makes the right call. I have checked by scrolling down and all the reads with deletion are shifted. Only the artificial haplotype read is correct. I have uploaded the data snippet, named dalia_shifted_cigar.tar.gz It contains a snippet of recalibrated realigned bam file. Thank you for sharing this. I have submitted a bug report and will let you know when it is fixed.